Bialetti Brikka vs. Moka Express Comparative Test & Review. Does Brikka make real espresso as pump espresso machines do? Most of Bialetti’s stove-top coffee makers (aka moka pots) have similar construction and varies only by design and materials. There are classic aluminium models like Moka Express that Bialetti’s factory in Italy has been producing with no changes since 1933. There is also a Bialetti Junior – same design and construction, but made in China and, thus, cheaper. There are many stainless steel versions: cone-shaped Venus or stylish Musa. And many more models including colorful Fiametta series. All of them have the same brewing system. One well-known model that stands apart is Bialetti Mukka (here it is at Amazon), which is designed to make cappuccino. However, there is one more less famous model – less known Bialetti Brikka. Despite the fact that it looks very similar to other aluminium moka pots by Bialetti, it’s unique because of the pressure valve, that changes the brewing process. Brikka comes in 2 versions: for 2 cups ( see @ amazon) and for 4 cups ( see @ amazon). It’s 2 Oz and 4 Oz respectively – see measurements below. 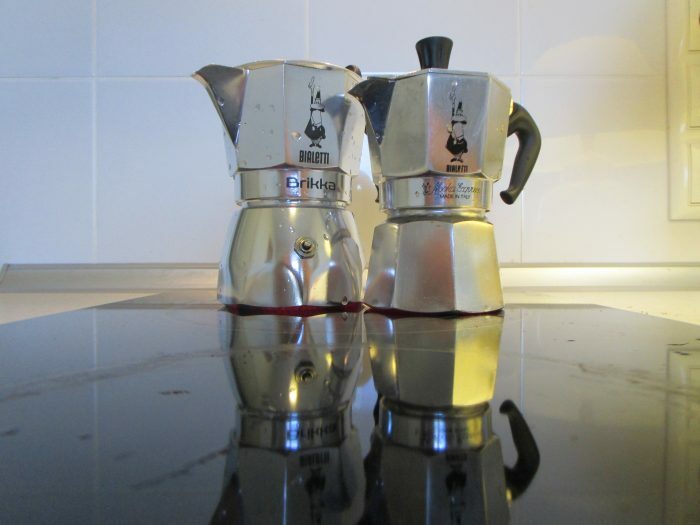 Does Bialetti Brikka really make different coffee if compared to the classic Moka Express? The crema. Brikka makes richer coffee foam. This is quite obvious if you saw some photos on the Web or read other reviews. The coffee is a bit stronger. Quite obvious too, however, the difference is not dramatic, Brikka gives just a bit more caffeine than Moka Express does. The taste! This one is not obvious at all (was not obvious to me, at least), however, it’s probably the most effective difference. When you try coffee made on Moka Express (just after tasting Brikka’s one) you understand that Moka Express gives more watery taste, less rich. Sometimes even more bitter, overextracted flavor. Even the ground coffee/water ratio is similar to real espresso. 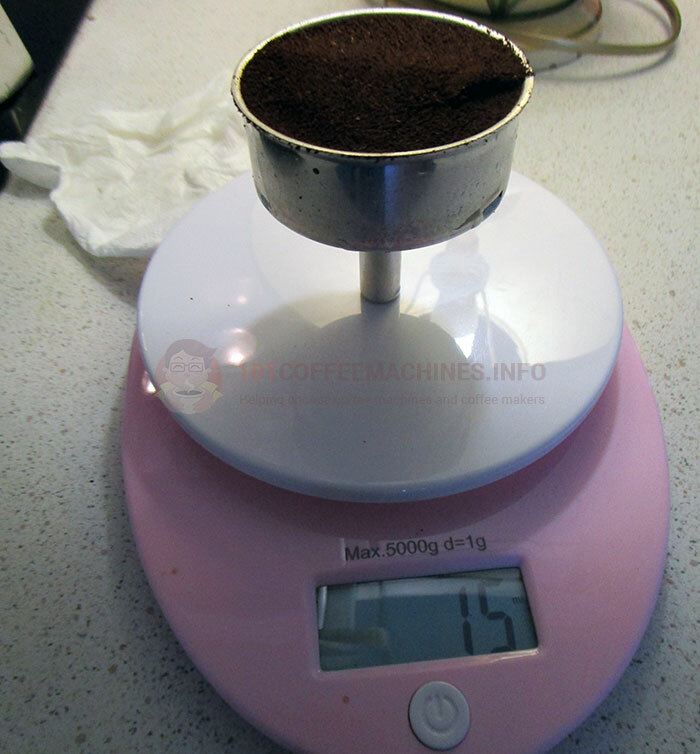 My measurements show that the Brikka for 2 cups is designed to brew 60ml (2 Oz) of coffee using 15 g of ground coffee. Yes, I know that often on Amazon it is written to be 3 Oz. However, it’s a mistake. Lower bowl indeed can fit even more water (up to 100 ml/3 Oz), however, the special “H2O” level inside Brikka shows, that it is recommended to use 65-70 ml of water – output is slightly smaller because ground coffee absorbs some water. Classic moka pots use less coffee and more water. However, when the third cup is tested (espresso shot made on a classic pump espresso machine, in my case it was Delonghi EC155M), then you realise that Brikka doesn’t make espresso. It makes strong espresso-alike coffee with rich crema and taste, but it cannot compete with pump machines. 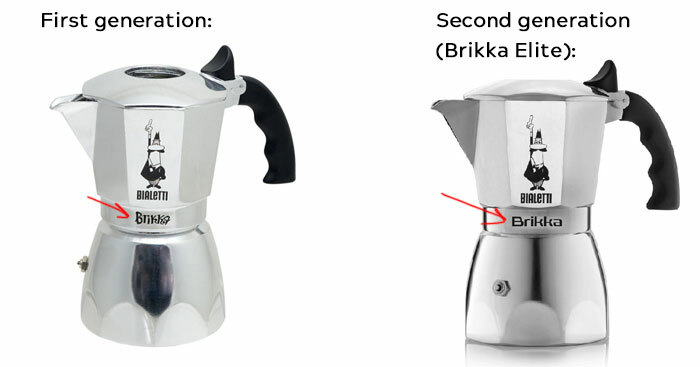 I completely forget to mention one more difference between Moka and Brikka. The later one is faster. I tested equal-sized models (both for 2 cups) on the same stove. In case of the Brikka it takes 2 minutes 36 seconds to make coffee, while Moka Express needs 3 minutes 50 seconds. 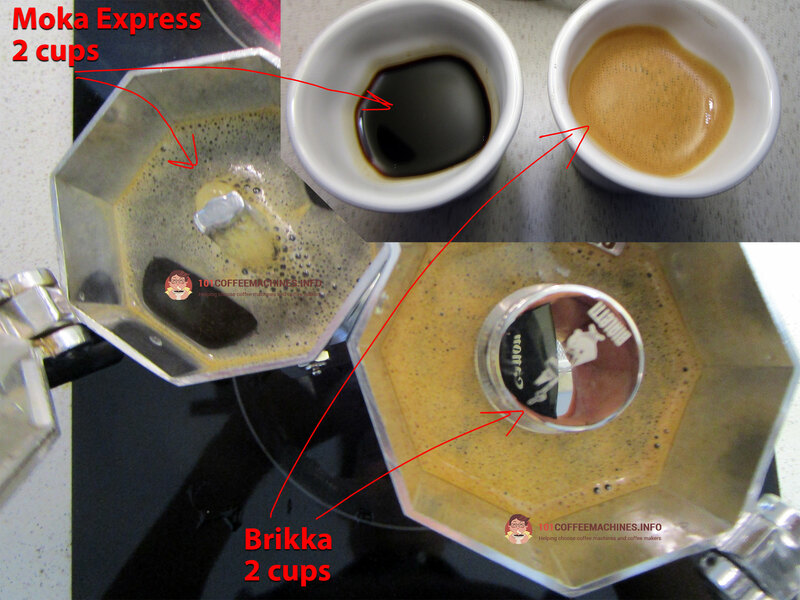 Why some other reviewers say the difference between Moka Express and Brikka is undistinguished? Common problems with Brikka is possible reasons. Bialetti’s quality control system is not superb (no suprise for me since years ago we had a Fiat in our family). In case of Moka Express or any other ordinary moka pot the construction is simplier and frequent problems are widely troubleshooted. In case of Brikka the are more parts that could be defected and due to lack of information people couldn’t understand that their Brikka is defective. This leads to low pressure (because water partly goes back to the lower reservoir) and no (or not much) crema. 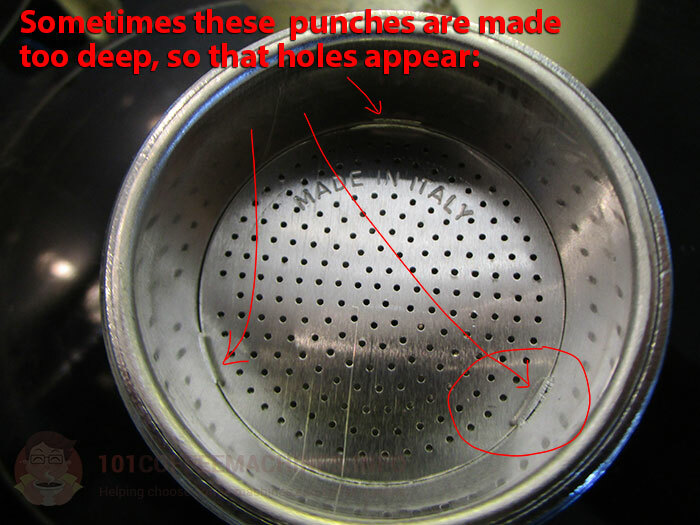 In Bialetti they probably know about this problem, because a funnel for Brikka as a spare part has different construction: without punches and therefore without risk of getting a hole. However new Brikka moka pots come with old funnel, which can be defected (or can be not, the risk is not high, maybe 1 out of 100). New funnles are sold on Amazon, however wider available funnels for Moka Express can be used as well. 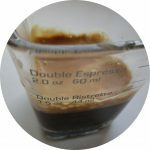 For example, a funnel for Moka Express for 6-cup can be fit into Brikka for 2 cups (as reported in this review). The method that Bialetti used in Brikka is not innovative. 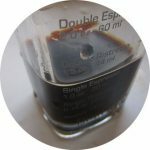 Manufacturers of pump espresso machines use it since 1990s – they discovered that if they will limit the pressure on the exit of the portafilter, then the espresso will have full taste and crema on top. This was particularly important for home users who use cheap preground coffee and do no tamp coffee well; on the espresso makers with pressure valves thay still can get a decent shot of espresso. 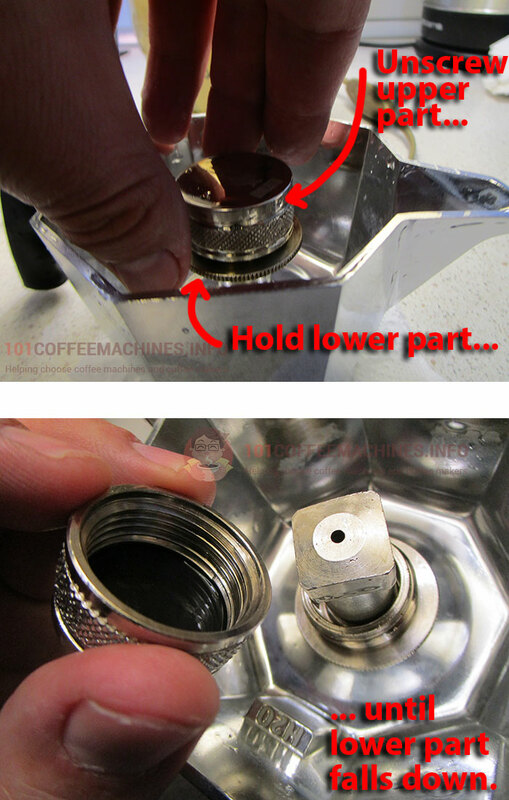 Today 99,9% home espresso machines come with pressure valve (aka crema filters). The only exception I know is the Delonghi EC145 and EC146. Bialetti implimented the same idea. However in case of a moka pot where the water/coffee goes upward, the construction of pressure valve could be simplier than on espresso machine (where water goes through ground coffee downwards). 0800116 for 2 cup version. Check on Amazon or eBay. 0800117 for 4 cup version. Check on Amazon or eBay. 0800013 for 2 Cup version. Check on Amazon or eBay. 0800014 for 4 Cup version. Check on Amazon or eBay. Bialetti does not produce handles and pressure valves as spare parts. Peculiar properties: Two version: for 2 cups (0006188) and for 4 cups (0006184). Made in Romania. Only 2 cup and 4 cup versions. 3 oz in amazon description of 2-cup Brikka isn’t correct. 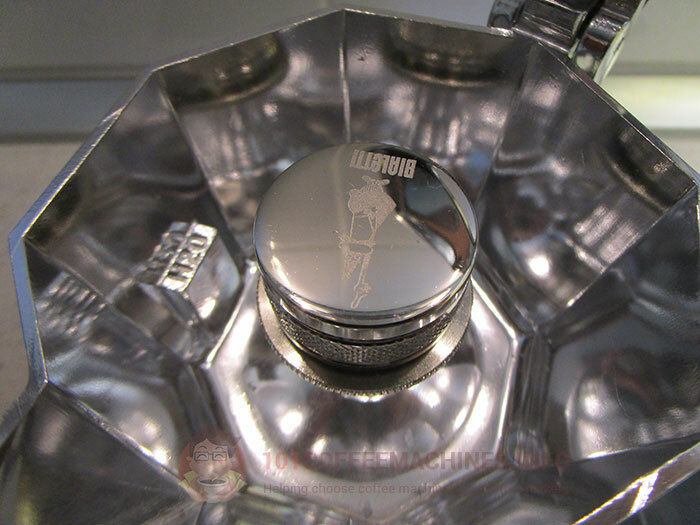 You can fit 3 oz in the lower bowl, however the instruction clearly says to use only 60 ml (~2 oz). There is a special measuring mark in the upper bowl of the new Brikka Elite. The correct ratio of water and steam gurantess that the crema filter will work as it should. The 4-cup Brikka respectively will give you 4 oz of coffee. Bigger stovetops are bad, the coffee is tasting burned when it is so long time on stove. So, You have to make serveral pots with this small pot. I am curious are there any actual differences between the elite and the one you have labeled “first generation”? Note that your “first generation” is actually the second generation, as there was an earlier model that had a plastic covering where the current window is, lacked the internal ledge indicating the appropriate amount of water (instead it shipped with a plastic measuring cup), and used an extra gasket internally for the funnel. I have both of these but have not seen the elite. Thank you for the correction, Len! Probably I’m too young to remember the generation Zero 🙂 I saw the Brikka with a second rubber gasket on youtube, by the way, and was curious. However, it was ordinary Brikka (without plastic covering on top as you describe). Elite has a slightly (very slightly – 1 mm or less) different funnel diameter. Everyhing else looks the same for me. I have the generation zero with the knob in the middle of the lid. As the funnel or its gasket (or both) is different, can I get replacements for these? Thanks! Please help to choose between elite and regular brikka – is the problem with the holes in the funnel is not present in elite version? P. S. I’m quite sure that when you see in one shop “Brikka” and in other shop “Brikka Elite” it’s really two different versions. Most shops in most countries sell current version, some of them may forget to rename it (since the “Elite” prefix is not written on the box or on the coffee makers itself). Great info here… thank u. New to Brikka, but I have a Moka pot that I use regularly. I just got a Brikka and it has blown up on my stove twice…following all I have seen in manual and on net– 2 oz water marking in upper chamber, med heat, every part is clean and drains water correctly when tested (like the pressure should drive it when heating), grind is not too fine, not tamping coffee, seal is clean and in good shape, pressure release in bottom chamber can be pushed out so not clogged, no holes in filter as u describe above… I’m lucky I’m not blind–I didn’t know they did this until I started researching–I could have been looking down at pot. Never a problem with my Moka pot that is another brand. Any suggestions? Hi, Sammy! What exatcly do you mean by “blow up”? Anyway, please describe your issue in more details. I have the original Brikka (has an extra rubber gasket around the perimeter of the funnel, as well as a clear plastic view window in the lid). I also have the newer, next version Brikka (but not the Elite). There is a very slight difference in capacity when comparing the two funnels… marginal, but there. Both perform admirably after many years of daily use. (Both are 2-cup models, for optimum brew.) I always use less water than the suggested 80 ml., and this helps to make the brew more espresso-like in flavour & mouthfeel, and also results in more crema— as there is more room for more steam pressure to build in the lower chamber… at least, that is my guess. Using 56 ml of water gives the most espresso like result, but I often brew with 70 ml for a bit more to drink. Lots of experimenting can give you the best “recipe” for technique, with exceptional results. Never had any problems with explosions or leakages, etc… but I do think people don’t usually make the brew in a way that achieves the best result. There should never be bitter or sour tastes, never any burnt taste. If there are any off-putting tastes, you are not making it right. Take the same care and preparation of the “puck” as you would for espresso if you want remarkable results. (Of course, fresh roasted coffee beans, and an espresso level grinder— be it manual or electric—will greatly improve the results.